Many people take exception to ‘no food’ and bag checking policies at cinemas and other places. This guide, the contents of which we in no way endorse, will make you aware of some of the methods people go to in order to get their favourite foods and beverages into cinemas. For entertainment purposes only. SERIOUSLY. You’ve been warned. Obviously many of these methods will be applicable outside the confines of the silver screen (though you may get some strange looks trying smuggling items where no such rules are enforced). Baggy clothes can hide a multitude of sins. They can also hide a multitude of forbidden foodstuffs. As long as you don’t weight yourself like a beast of burden you can transport more than your fair share of goods. In cold weather you can use the sleeves of a long coat to transport things such as cans of drink. 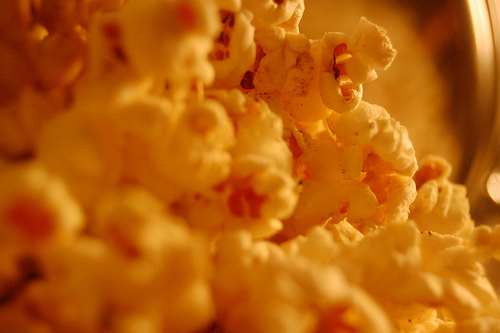 You can sneak pretty much anything in a box of popcorn. Of course, many seasoned professionals look down on the technique, since it involves buying something from the cinema. Eat some of the popcorn. Place forbidden item beneath popcorn. It’s safer in large groups, as theatre staff tend to not want the hassle of holding a large group of people up. If you are in a group don’t hand your tickets to be torn one at a time, hand them in a bunch. They are much more likely to simply count the tickets and wave you through than pat you down one at a time. This isn’t always the case when their managers are around, though, so be careful. If caught, don’t worry about it. Worst case scenario will see your foodstuffs confiscated (so long as you are polite).